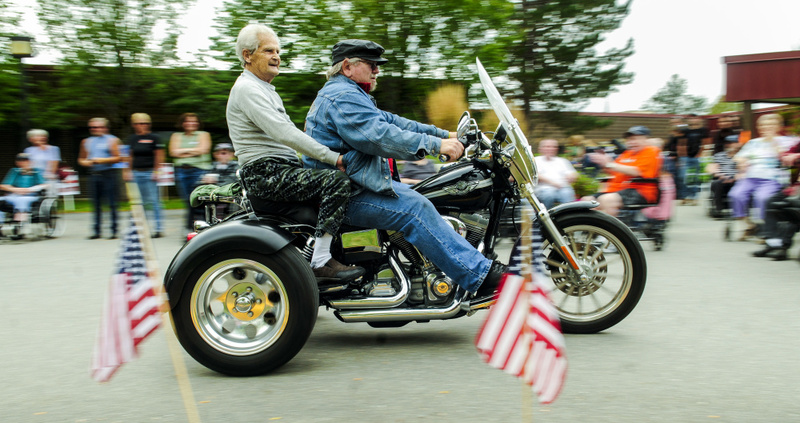 The Maine Fallen Heroes Bike Run lets older adults in Augusta go for a ride to raise money for Gold Star families. 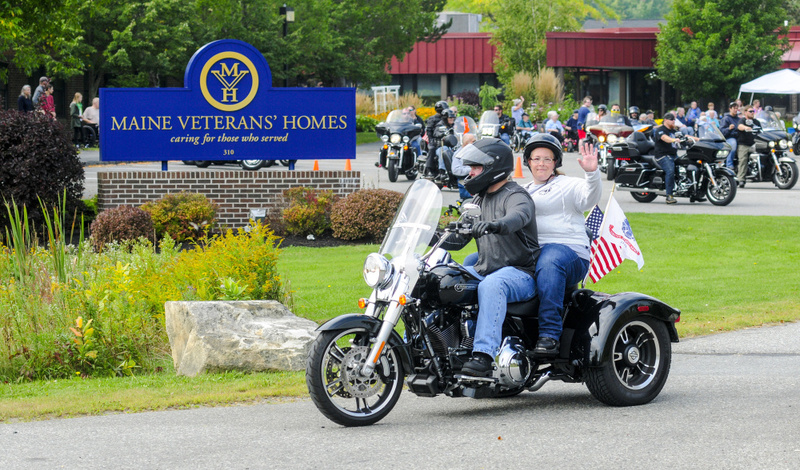 AUGUSTA — Motorcycles roared into the Maine Veterans Home in large and small groups Saturday morning for the 2017 Maine Fallen Heroes Bike Run. It was billed as the first annual event. 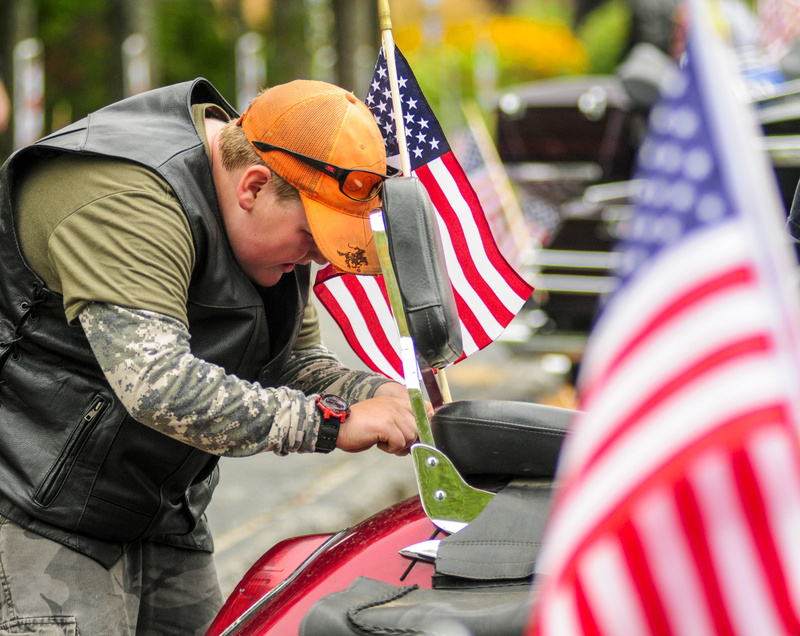 After offering residents of the home brief rides on a trike or bike, scores of motorcyclists took off for L-A Harley-Davidson in Lewiston behind Kennebec County Sheriff’s Deputy Jeremy York, who was assigned to see them as far as the Pearl Harbor Remembrance Bridge, between Gardiner and Randolph. Many of the residents at the Maine Veterans Home wore ballcaps indicating that they were veterans of World War II. Norman Gervais, 91, was one of them. He said he liked his ride atop the 2003 Harley-Davidson Dyna Super Glide trike driven by Alfred Tuttle of Madison. Gervais said he used to have a motorcyle of his own. “I got that when I got out of the service in 1945,” he said, with some prompting about the year by a friend, Raymond “Jinks” Pauley. 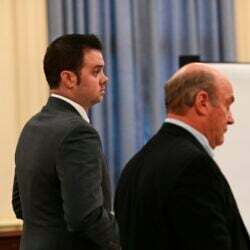 Gervais, Pauley and a group of other men were seated in wheelchairs near the home’s front entrance. Pauley, 60, said he didn’t plan to ride. “I was scared I’d get the bug,” he said. Pauley said he used to ride both a Harley-Davidson Sportster 1000 and a dirt bike. “I’m mildewing, though,” he added. Another in the group, Richard Patterson, said Gervais “was just a-smiling” when he finished his ride. While admiring the passing motorcycles, including a pair of spotless white Indian motorcycles, Patterson, 79, said he never owned one because he was more interested in custom cars. Small, who served in the Air Force as a mechanic, said he used to put about 12,000 miles on a motorcycle each year for about a dozen years. The veterans and their supporters cheered each time someone took a spin on the bike. “Hang on, Mary,” they hollered as Mary Lane, 78, of Waterville took a turn. The ride went well despite what she termed “a stiff leg.” She served in the Air Force in 1957. “I was in radar, which is no longer in existence,” she said. David Reed, 95, formerly of Boothbay Harbor, refused an opportunity to ride, despite the encouragement of his daughter, Mary Beth Coniff, who was visiting. The bevy of bikes brought back memories to Mike Munoz, who was born and raised on Guam in the western Pacific before moving to California, where he worked as a supply officer for 23 years. He retired from Brunswick Naval Air Station just before its closing. “I used to ride a motorcycle when I was young,” he said. On Sunday, he was content to sit and watch. Tim Murray of Benton was busy polishing his 2013 Harley-Davidson Street Glide with the license tag “SEMPAFY” while waiting for his brother and sister-in-law to arrive. The event was set up as a partnership between the Maine Fallen Heroes Foundation and Maine Veterans’ Homes Augusta. The donations would be shared by the Gold Star Kids Trust Fund and the Augusta home’s activities fund, according to a news release from Maine Veterans’ Homes. On Saturday, Dean Barron, who helped organize the bike run, said that the group had identified 20 to 25 children of Gold Star Families in Maine ages 3 to 15 and said the Maine Fallen Heroes Fund, a 501(c)(3) nonprofit, does a number of things, including offering scholarships every year. Barron’s son, Cpl. Joshua Philip Barron, a 2007 graduate of Bonny Eagle High School, who served in the Marine Corps, disappeared March 15, 2011, and was found dead six days later. Barron said he hoped Saturday’s event would raise $5,000 to $6,000. Steve Greve of Hallowell was one of the motorcyclists, arriving on his Honda 700. “I can’t manage the weight of the Harleys,” he said, showing how the cane he was leaning on could be folded into four pieces for storage in a saddlebag.